In this modern age of marketing and advertising, there’s nothing quite like some good old fashioned independent analysis by someone without a horse in the race. An endorsement doesn’t come easily, which is why Danner is especially proud to be recognized by two of the leading publications on outdoors activities. Danner’s new Crater Rim (37440) technical hiking boots were awarded “Gear of the Year 2012” by leading industry publication Outside Magazine. Few people understand outdoor gear as well or as deep as Outdoor Magazine and its readers. They’re the resident experts of the outdoor activities world. Needless to say, it’s a pretty prestigious honor. The Gear of the Year awards are selected by Outside Magazine to acknowledge the premier products that are made to support and outfit the outdoor activities the magazine’s readers love. In the publication’s summer buyer’s guide, Crater Rim hiking boots were awarded “Best Trail Shoe 2012.” This means that Outdoor Magazine believes the Danner Crater Rim technical hiking boots have surpassed its competitors as the finest hiking boots in the category. Crater Rim hiking boots are crafted entirely in Danner’s factory in Portland, Oregon. So they’re 100 percent American-made. And they’re inspired by American pride. These premium backpacking boots are modeled after a popular style which were made for the U.S. Army soldiers who have been deployed into the mountain regions of Afghanistan. If they’re good enough for the soldiers who need them most, they’re certainly good enough to support your hike. Superior craftsmanship and unmatched durability have become standard-issue with the Danner brand, and it’s what caught the eye of Outside Magazine. But the Crater Rims weren’t the only Danner hiking boots to receive high honors from an outdoor enthusiast magazine. The all-new Mt. Defiance heavy-duty hiking boots were recently highlighted in Backpacker Magazine’s Spring Gear Guide for having the “best support” in the “heavy duty” boot category. It’s not the first big award from Backpacker Magazine for Danner, which has been making the highest quality hiking boots for more than 80 years, including the very prestigious “Boot of the Year” fromBackpacker for the Danner Mountain Light hiking boots in 1975. Danner was the first manufacturer to incorporate GORE-TEX waterproof lining in its outdoor boots, and has been leading the way ever since. 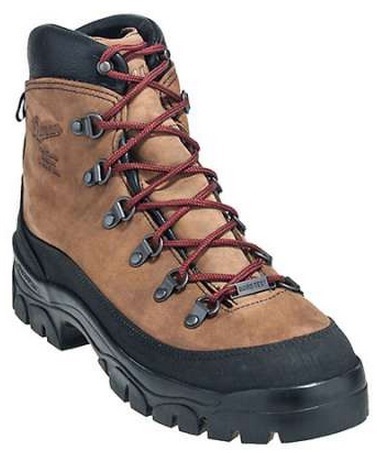 So head to Workingperson.com to pick out your pair of Danner Crater Rim hiking boots today. They’re durable. They’re comfortable. They’re awesome. Simply put, they’re the best. But don’t take our word for it. The independent analysts have spoken. Or, you could put them on and see for yourself. You can write to the magazines and thank them later.